Maestro Kirk Muspratt and New Philharmonic (NP), the 60-member professional orchestra in residence at the McAninch Arts Center (MAC) located at 425 Fawell Blvd., on the campus of College of DuPage opens its 2015-2016 Season with a multi-media concert event, “Heavenly Bodies of Holst” Oct. 3-4. During the first half of the concert, Maestro Muspratt will feature a short film clip on each of the of the seven movements, providing insights about the music and the composer’s use of instrumentation to create a specific mood for each of the seven planets. On the second half , Dr. Salgado joins Maestro Muspratt and the New Philharmonic and introduces each of the planets from an astronomer’s point of view. The orchestra will then perform each movement choreographed to Dr. Salgado’s dazzling high definition films, which were created to follow the tone and tempo of the music, matching the images frame by frame, note by note with the music. Following the performance everyone is invited to mix and mingle with Muspratt and members of the orchestra for a “Cookies with Kirk” reception sponsored by Brookdale Glen Ellyn. Born in Cheltenham England in 1874, Holst began composing while at Cheltenham Grammar School and spent two months at Oxford learning counterpoint before being sent to London to study composition under Stanford at the Royal College of Music. During a tour of Spain in 1913, a fellow traveler introduced Holst to astrology. The large-¬scale orchestral suite that resulted from this interest is inspired by the astrological characters of seven planets in our solar system (except for Earth and Pluto which was yet to be discovered at this point in Holst’s life). Holst completed the opening movement, Mars, The Bringer of War in 1914. He composed the remaining six movements, Venus, The Bringer of Peace; Mercury, The Winged Messenger ; Jupiter, The Bringer of Jollity; Saturn, The Bringer of Old Age; Uranus, The Magician and Neptune, The Mystic over the next two years. The first complete public performance of “The Planets Suite” was held on Nov.15, 1920.It was Holst’s first and only composition to reach a wide international audience. Many of the movements from “The Planets Suite’ have sparked take-offs by other composers in the form of theme songs, for TV, movies, or for the radio. José Francisco Salgado is an Emmy-nominated astronomer (BS in Physics, Univ. of Puerto Rico; PhD in Astronomy, Univ. of Michigan), experimental photographer, visual artist, and public speaker who creates multimedia works that communicates science in engaging ways. As executive director and co-founder of KV 265, a non-profit science and arts education organization, Salgado collaborates with orchestras, composers, and musicians to present films that provoke curiosity and a sense of wonder about the Earth and the Universe. His Science & Symphony films have been presented in more than 100 concerts and have reached a combined audience of more than 250,000 people in concert halls, museums, and lecture halls spanning 45 cities in 15 countries. As an experimental photographer, Salgado has visited more than 30 scientific sites in places including the South Pole, the Atacama desert, the French Pyrenees, and the South African Karoo. As a public speaker, he has given presentations about science and art in all seven continents, including a presentation at the Amundsen-Scott South Pole Station. New Philharmonic is a professional orchestra in residence of the MAC that has inspired classical music enthusiasts in Chicago and the suburbs for nearly four decades. 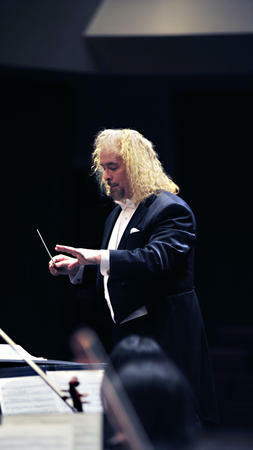 Under the direction of Conductor and Music Director Kirk Muspratt, named a 2006 Chicagoan of the Year by the Chicago Tribune, the group gives innovative treatment to both classic compositions and modern works and strives to make the music accessible to new audiences and youth through a variety of educational efforts. New Philharmonic (NP), under the direction of Maestro Kirk Muspratt presents a multimedia concert of The “Heavenly Bodies of Holst,” at the McAninch Arts Center, 425 Fawell Blvd., Saturday, Oct 3 at 7:30 p.m. and Sunday, Oct. 4 at 3 p.m. Tickets are $49; $47 for seniors. A limited number of $10 student tickets will also be available, with valid student ID. To order tickets or for more information, call 630.942.4000, or visit AtTheMAC.org.